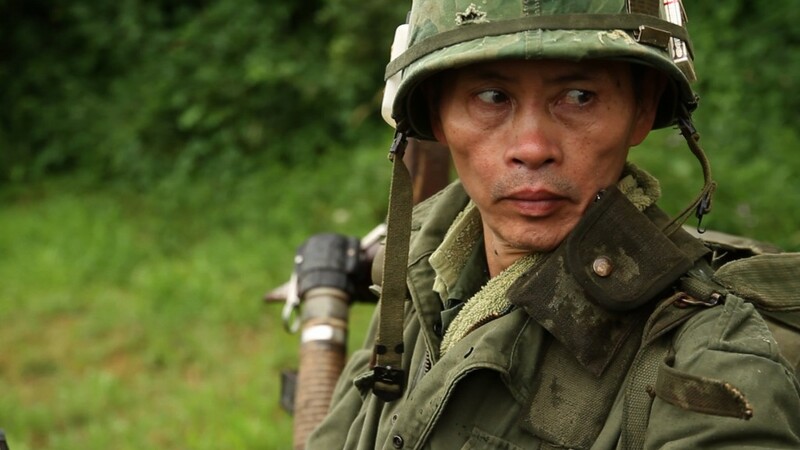 “In Country,” a new documentary from filmmakers Mike Attie and Meghan O’Hara, follows a group of men who are dedicated to authentically reenacting the Vietnam War. The film recently debuted at the Full Frame Film Festival and is making the festival rounds. It follows the group of actors as they suit up, learn about details of the war and then head out into fantasy combat filled with night patrols and ambushes. Many of the participants are vets of wars in Vietnam, Iraq and Afghanistan. Others are between deployments, and a few have not served in the military. Attie and O’Hara followed a small group of the actors who reveal their own battles with PTSD and the difficulty of re-adapting to life after war. Art Beat recently spoke to Mike Attie and Meghan O’Hara to hear more about “In Country.” The transcript below was lightly edited for length. ART BEAT: How did you come about this story? What drew you to it? MIKE ATTIE: I had studied history when I was an undergrad and was really interested in the idea of reenacting, just conceptually even before I knew this was going to be a film. 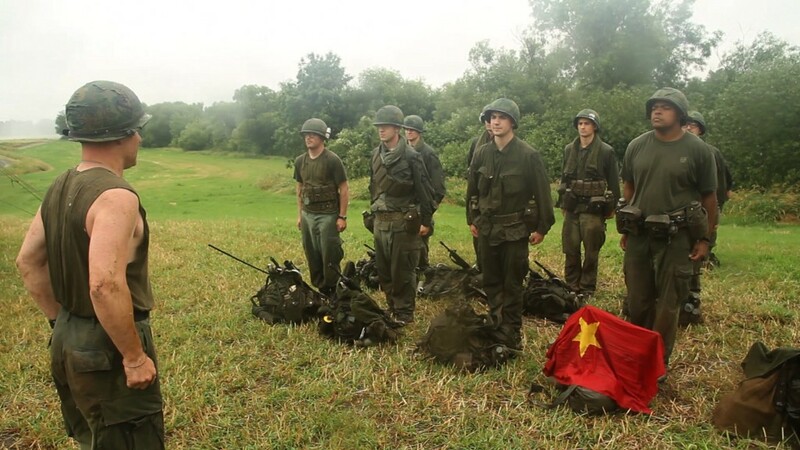 Growing up on the East Coast, Civil War reenactments were a big thing and something I was obviously very aware of but at some point I’d heard that people were reenacting Vietnam, and the idea really just blew my mind that somebody would do that. I was born in the late seventies, but I felt I grew up kind of under the shadow of Vietnam. I had a father who fled the country to avoid the draft and an uncle who volunteered and so it was one of these subjects that was spoken about in hushed tones growing up. 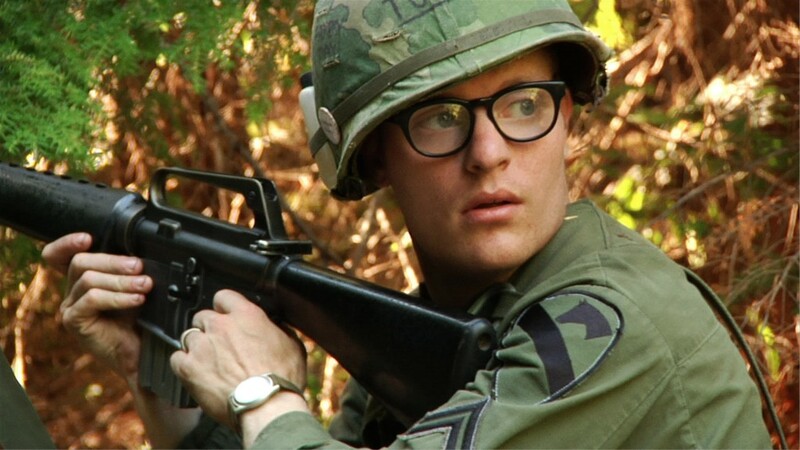 I think that all of us of that generation have a strange relationship to that war, so the idea that somebody would want to reenact it really blew my mind. I went to grad school and it was there that I met Meghan and told her about the film and told her that I’d really like to work with her on it. We were really drawn to this group in particular because they had so many vets in their ranks. It’s not typical necessarily of a Vietnam reenactment group to have so many recent vets and active military people. They had two Vietnam vets, including the South Vietnamese guy, Vinh, and then people who had served in Iraq, Afghanistan and then actually some active duty troops as well, so we were just really drawn to this particular group. MEGHAN O’HARA: It’s interesting to think about when recent history becomes history with a capital “H.” It feels really different when you think about someone reenacting the Revolutionary War than when you think about someone reenacting Vietnam, when people that participated in it and made the decisions about the war are still alive. To be wrestling with a history that is so current was really fascinating to us. ART BEAT: As you mentioned, some are veterans of the Vietnam War, both American and Vietnamese, revisiting their time there. Others are veterans of or between deployments in Iraq and Afghanistan. One is even a high school student. What do you think brings all these people together? MEGHAN O’HARA: We really went in there with the question of “Why?” We were really up front with them right away — “Why?” Why are you combat soldiers reenacting at all? Why are you picking Vietnam? What’s drawing you to all of this? What we discovered is people are really all there for their own reasons. I think the thing that binds them all together is a sense of community and a shared interest, but I think the real motivations, as the film kind of explores for each person, are really different. The age ranges from 17 to 65 in the group and someone like Vinh, who fought in the Vietnam War as a 17-year-old, his motivation is really different. He was fighting at that time to try to save his country and for him it’s been a way to go back to those memories and to face that path and to try to think about it in a new way. We ask him in the film, “Why would you want to go back to this? Aren’t these hard memories?” and he says it’s the time when he felt most strong and he felt like he was doing the most important thing he ever did in his life. It’s something that I think a lot of the soldiers that fought in Iraq and Afghanistan feel. When they come back, this experience that they had in combat was probably the biggest thing that’s happened in their life and there’s a significance to that that is hard to get back. So you have a character like Charles Ford — his nickname is “Tuna” — who is in-between deployments and he’s still wrestling with the fact that he’s got his family and he’s home but he misses being deployed and he feels really conflicted about it. Being in the reenactment is a way to be back in combat in a safe way. I think on some level, it’s fun, which was a really interesting thing for us to think about, someone playing Vietnam for fun. The film tries to explore this idea of attraction, what attracts men to want to be soldiers and the different motivations and then how many of them feel after they’ve come back and they had sometimes very positive experiences, doing a very good job or being in a very close community, but also very negative experiences from the trauma of being in combat and seeing the horrors of war that war always is. Staff Sgt. Lucien “Doc” Darensburg, served two tours as an Army Medic in Iraq from 2004-2005 and 2009-2010 and is currently serving in the Oregon Army National Guard. He speaks about his experience adapting to life after returning from war. ART BEAT: In a way, the film is really about how soldiers remember combat and, for some of the participants, the experience of PTSD. How do you think the act of recreating the Vietnam War experience feeds into that experience? I think that, in some ways, is good for him. As a group of guys, they’re able to talk about it a little bit more freely and I think that that’s a lot of the culture in the military today. Most of the guys in our film are open about the fact that they are getting help for their PTSD, that they are seeking treatment. MEGHAN O’HARA: Someone asked Doc that at Full Frame and he was sort of like “Well, I don’t know.” But, Bummy, the Vietnam vet who you see at the beginning end, the American Vietnam vet. He actually passed away before the film was finished. His wife was at the screening at Full Frame and she said that she really felt like he got a lot out of being part of the group and he had done all of the more conventional forms of therapy. It’s hard to say that it’s therapeutic in a medical sense, but they are all getting a little of what they need out there. The film does show the power of fantasy in a way. Also to that point, part of the suffering that the current day soldiers and even the Vietnam vets experienced draws them to Vietnam specifically. One of them said in a piece of interview that didn’t make it into the film — he was a three-time Iraq combat vet, three tours — “it’s easy to play WWII in a way because we went off to fight evil and won.” The guys who came back from Iraq and Afghanistan don’t really have that mythology that they can plug into to frame their own personal experiences. I think a lot of them are much more attracted to Vietnam as a history because they see it as more analogous to their own experience. They think, “I had it tough and the guys in Vietnam had it even tougher in many different ways.” So by playing them, they are thinking through their own experience. American Vietnam veteran Hayden “Bummy” Baumgartner explains why he wants to relive his experience during the war and his role as mentor to the group. ART BEAT: What was your experience making this film? MIKE ATTIE: Their reenactment is different than other reenactments. Civil war reenactments are often public displays. This is something that they do by themselves, removed from the outside world. In order to maintain and essentially keep their fantasy Vietnam, we had to dress as Vietnam War correspondents in order to film the events. Meghan and I went out in full fatigues. Meghan was the only woman within a large square mile radius. We did everything with them as they went off and did this reenactment. They let us use our modern camera, but everything else was completely authentic. I think it creates interesting moments in the film because I think often their addressing us as a soldier might address a correspondent in Vietnam. MEGHAN O’HARA: We traded wearing costumes for full access. ART BEAT: What was that having to wear the full fatigues? MEGHAN O’HARA: You realize that those clothes are pretty good for what you were doing in it, hiking. It rained for many days and we were sleeping on the ground and crossing rivers in wet clothes. One of their missions is they try to make it really hard on themselves. It’s almost like the more they suffer, they more they honored the veterans that they’re trying to represent. The film really aims to take you along on their experience and I think it was the best way to do that. ART BEAT: You juxtapose archival footage with the footage in the Oregon words. Why did you choose to bring archival footage into the film and how did you decide to use it? MIKE ATTIE: We put together a cut of the film early on that didn’t have any archival footage in it and our keen sense of the film was that you lost all the context and you lost a lot of the emotional trauma that was that. We realized pretty early on in the edit that we needed to have those images. I think that what we were looking for when we searched the archive was to find stuff that really felt like it was on the ground and immediate and with the soldiers. There are all these iconic images that bring us back to Vietnam that we see a lot in other Vietnam documentaries, like the napalm exploding out of the back of the airplane. But, because our characters were so interested in that experience of the soldier, we wanted to show that there are ways in which they are unable to achieve Vietnam, but then there are ways in which their experiences have really interesting parallels. As we edited it together, it becomes a way of showing the differences and then showing the striking parallels. Like later in the film when we hear Doc talking about his own trauma in the war and then seeing a solider in Vietnam and seeing that shared experience. I thought that it was really important to bring those worlds together. MEGHAN O’HARA: One of the things we really struggled with, which I think a lot of filmmakers who deal with subjects of war or any other violence or trauma, is what to show. For us, what we found ourselves most drawn to, that moved us the most towards some understanding of that experience, were these testimonial interviews in the field. It’s interesting to have that present tense (from soldiers fighting in Vietnam) along with the present tense of the reenactments and the similar kinds of modern day footage, the home movies that our guys brought back from Iraq and Afghanistan. You see the parallel between the guys that are in the reenactment and those. When a soldier says in the archival footage that he’s going to do his best to forget the war — us with our privileged position of having 50 years passed — you know that’s going to be a very difficult thing to do. It causes you to reflect on the long legacy of combat experience.